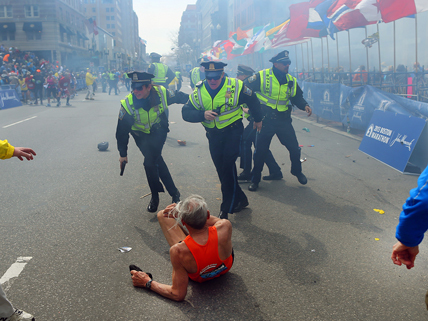 Police officers, with guns drawn, attend to elderly marathon runner Bill Iffrig near the finish line of the Boston Marathon following the first explosion on April 15, 2013. At 2:50 p.m. on April 15, 2013, two bombs exploded near the finish line of the Boston Marathon, killing three people and injuring more than 260. Almost immediately, social media sites like Twitter and Facebook lit up with postings of photos and comments about the attack from spectators, runners, and others. As cellphone use after the attack overloaded local networks, people turned to social media to contact loved ones. In the tragic aftermath, social media and smartphones were key to the sharing of information, even facilitating the identification of the bombing suspects. But there was a downside to what literary critic Michiko Kakutani calls “America’s first fully interactive national tragedy of the social media age.” Social media users on sites like Reddit and 4Chan decided they could help look for the bombers. Through online chat forums, they pored over crowdsourced photos and video footage attempting to ID suspicious persons. This amateur sleuthing led unfortunately to wrong identifications of innocent people in what some described as an “online witch hunt.” With speculation and rumors swirling online, the FBI released pictures of its prime suspects—captured from surveillance cameras near where the bombs went off. Many Americans followed closely the unfolding events in Boston via television, radio, and online, especially through social media. According to the Pew Research Center, one in four Americans got news through social networking sites, while for 18-to-29 year olds that figure was 56 percent. Once the suspects were identified as Tamerlan and Dzhokar Tsarnaev, Americans started learning about the brothers link by link, via their social-media histories. Details of Tamerlan’s online identity included an interest in Islamic radicalism. As the case unfolds, one can only wonder whether social media also played a role in the radicalization of the Tsarnaevs. Read how false leads and misidentifications spread through social media following the Boston bombing. Examine how people used social media to connect with family and friends in the wake of the Boston Marathon bombing. Learn about the roles various social media played for those seeking news about the Boston Marathon bombing. This article focuses on the way amateur sleuths scoured the Internet for clues to the motives of the Boston Marathon bombing suspects. how would someone do this?! it’s so sad! scary things happen you know.